Easy Garlic Butter Roasted Mushrooms is an easy yet impressive side dish recipe that’s totally mouthwatering! Whelp, Ben and I officially finished the second season of Orange is the New Black this week, or OITNB as the manic binge watching folk (ahem, us,) like to call it. Epic ending, but even better is I can finally get some sleep! Anytime Ben and I pick a new series to watch on Netflix we feel the inexplicable need to watch the entire season in as little days as possible, not to be bothered by important things like, oh I don’t know, yard work, going through the mail in a timely fashion, and hitting the hay before 11pm. Oh wait, I already do. Eating mushrooms. Are you sick of me talking about mushrooms yet?? I promise I’ll give it a rest right after sharing this recipe for Easy Garlic Butter Roasted Mushrooms, aka the one side dish you will NEVER STOP MAKING EVER! 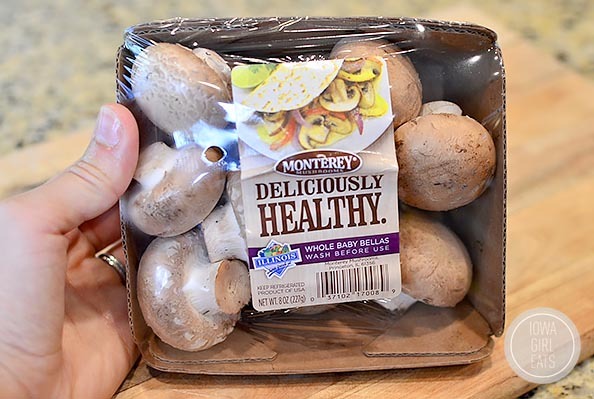 These mushrooms will make your mouth water in a way that only garlic and butter can…well that and salt and vinegar chips. Ben picked me up a bag the other day and omg, drool. Does that man get me or what? Delicious staple side dishes are tough to come by. Often they take a little bit of fuss that I don’t want to deal with and/or it’s a side salad which, let’s be real, isn’t very exciting. Side salad: I’m just not that into you. There, I said it. Anyway pair said side salad with Easy Garlic Butter Roasted Mushrooms and you’ve got yourself one heck of an epic dinner accompanying duo. Whole mushrooms are scrubbed then pan-roasted in butter melted with fresh garlic until tender and slightly crisp on top. Like I said – addicting in a way that only garlic-butter flavored foods can be. They’re a category all on their own. You know what I mean. 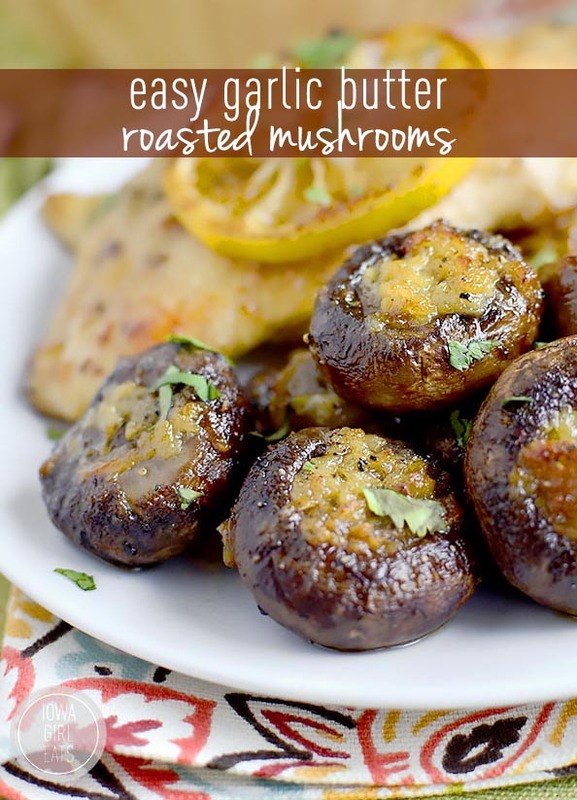 Start by picking up a 16oz container whole mushrooms – baby bellas, white, whatevah – they all roast up deliciously. 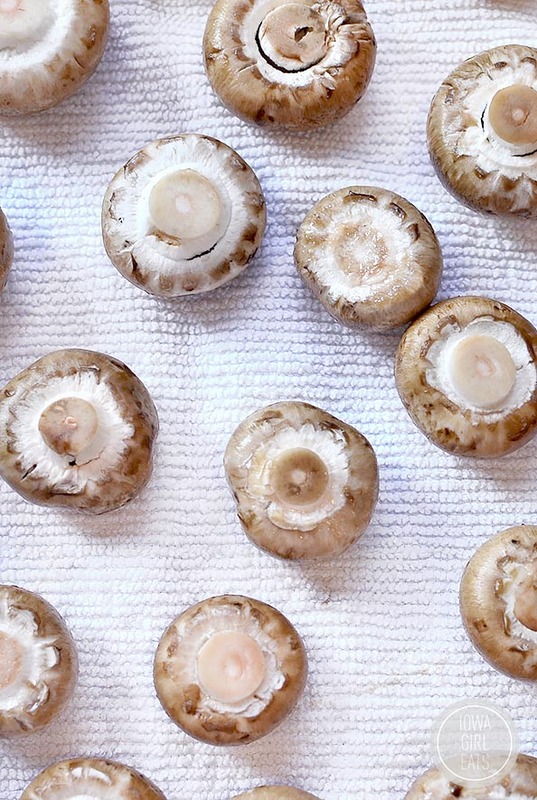 Gently wash away the dirt on the outside of the mushrooms then trim down any unruly stems and pat dry with a kitchen towel. 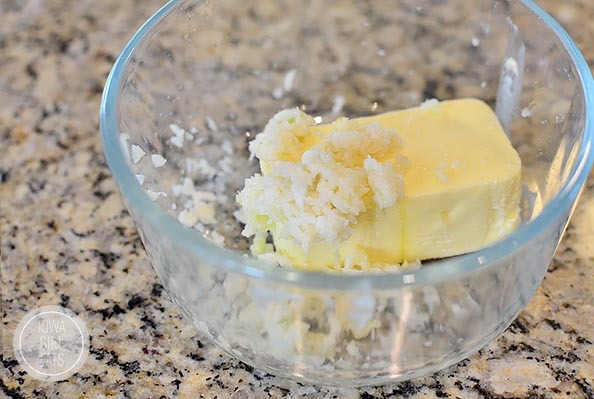 Add 1/4 cup butter and 4 cloves minced garlic to a small dish then microwave until melted, about 30 seconds. Ben and I both adore garlic so four cloves was just the right amount for us, but if you’re a little sensitive I’d go with two or three. I’ve also made these mushrooms with Earth Balance vegan butter because I wanted Lincoln to try them (spoiler alert: he refused,) and they were just as delicious. So just know this dish could be vegan if you need it to be! Now, while we’re doing the mushroom wash and garlic butter dance, pop a large cast iron skillet into the oven then preheat it to 400 degrees. I like the way the hot skillet causes the bottoms of the mushrooms to sizzle when I place them inside. If you don’t have a cast iron skillet you could definitely use a pie pan or baking dish. You won’t need to preheat those first though. 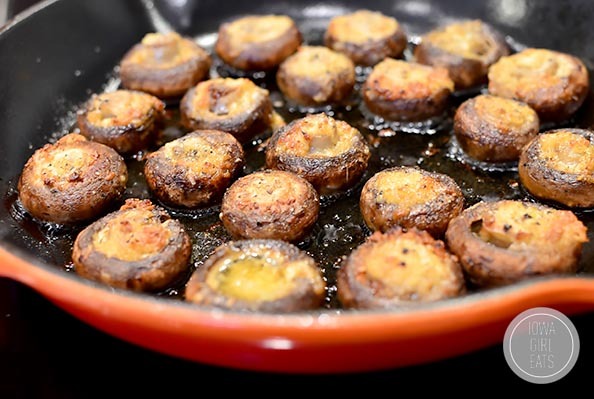 Place the mushrooms into the preheated skillet, cap side down, then drizzle the garlic butter on top, taking care to try and contain the garlic to the top of the mushrooms vs letting it fall down into the skillet or pan which could cause it to burn in the oven. Season with salt and pepper then roast for 25-30 minutes, basting the mushrooms with the butter in the bottom of the skillet halfway through. 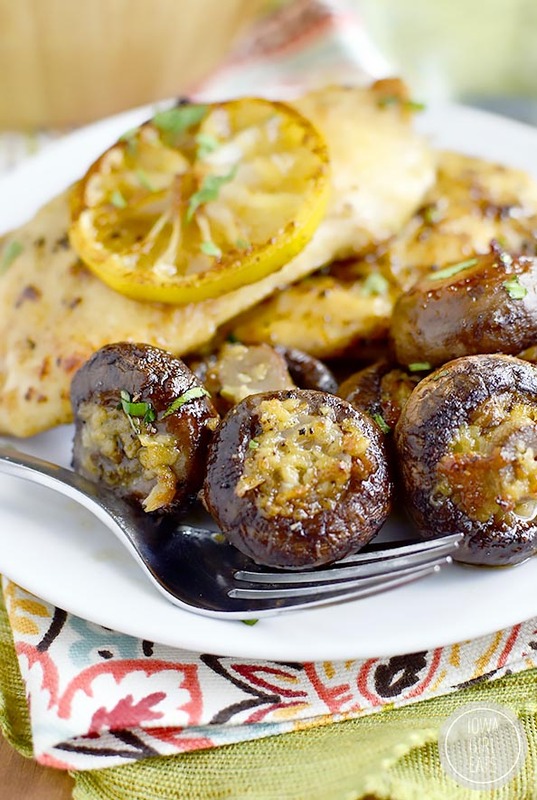 Easy Garlic Butter Roasted Mushrooms are up! Add butter and garlic to a small dish then microwave until melted, 30 seconds. 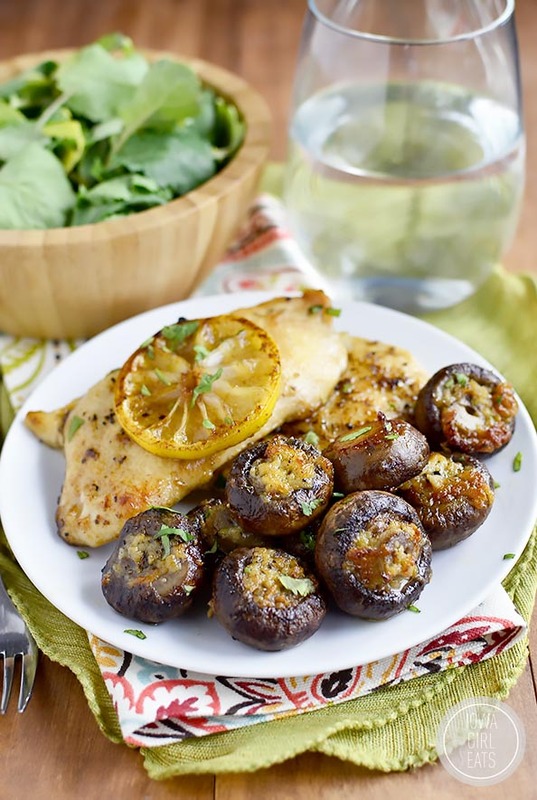 Trim ends off mushrooms with a small knife then place cap side down in skillet or baking dish. 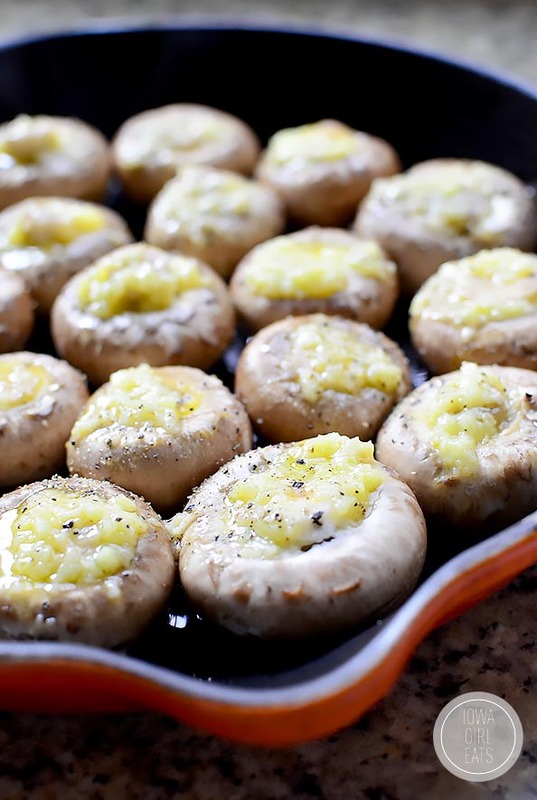 Drizzle each cap with garlic butter, taking care to get garlic on the mushroom vs on the skillet or baking dish, then season tops with salt and pepper. 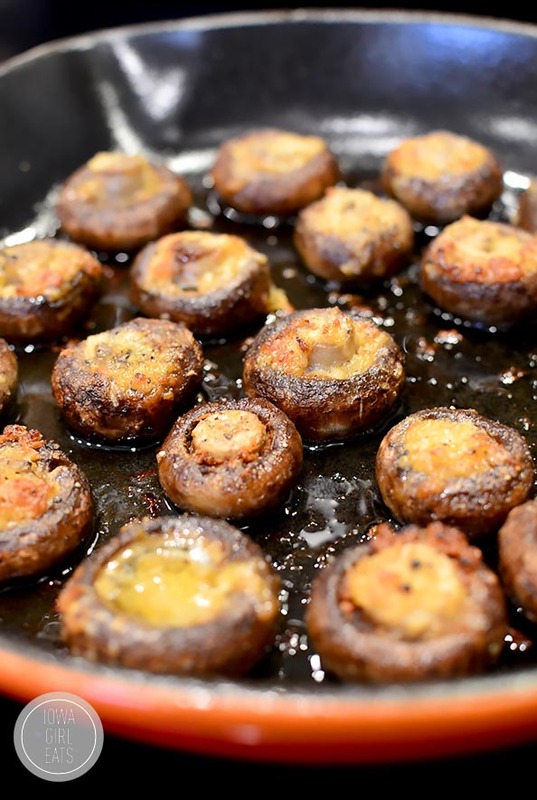 Roast for 25-30 minutes, or until tender, basting mushrooms with butter in the bottom of the skillet halfway through. If you’re a mushroom lover like me then you’ve got to make this recipe ASAP. Both Ben and I agreed it’s one of the bests side dishes with dinner we’ve ever had. Enjoy! 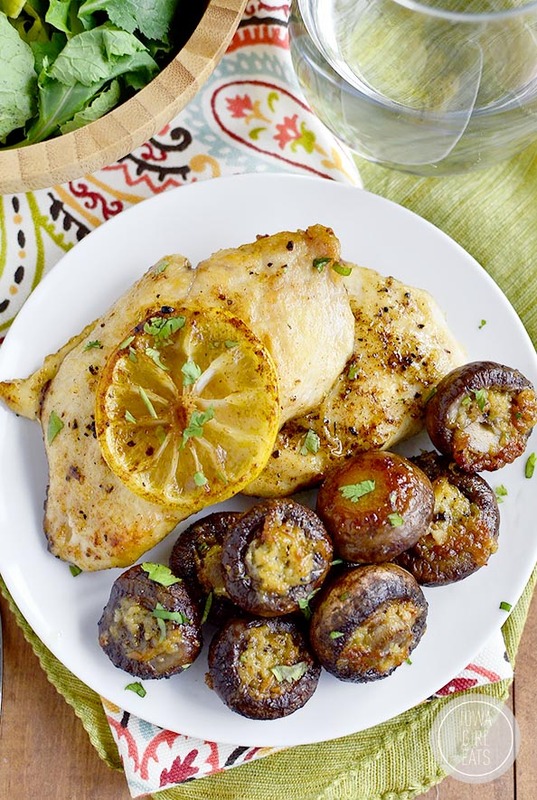 0 Response to "Easy Garlic Butter Roasted Mushrooms "